This entry level handset is small in size, but can it achieve big things? Can this bite-size handset become an entry-level feast? 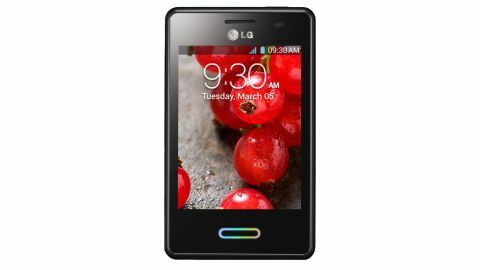 The LG Optimus L3 2 is likely to really struggle to compete in the budget phone market. If you just want a feature phone you can get one for less, while if you want a smartphone you can get a substantially better one for not much more. LG might mostly be known for the popular Nexus 4 and other premium smartphones but that only accounts for one end of its range. The LG Optimus L3 2 takes a position right at the other end as a truly entry level handset. With a price tag of roughly £90 SIM free, or available free on contract from around £7.50 a month the LG Optimus L3 II is going up against the likes of the ZTE Blade 3, HTC Desire C and the Huawei Ascend G330. With a dinky 3.2-inch low resolution screen, a 1GHz single-core processor and just 512MB of RAM the LG Optimus L3 2 might not be up to much, but in this sort of price range that doesn't necessarily matter. First impressions of the handset are in line with what you'd expect from a cheap phone. The 102.6 x 61.1 x 11.9mm body is shorter and less wide than most phones, though it looks and feels quite chunky. At 107g it's light too, but that's no surprise given the plastic body. It feels disconcertingly light actually but aside from that it's comfortable to hold, with curved edges making it fit nicely in your palm. The front of the LG Optimus L3 II is a fairly plain affair, with the dinky 3.2 inch 240 x 320 IPS LCD screen in the centre, large black borders above and below it and narrower ones to the side. The screen itself is far from impressive when you consider that the similarly priced Ascend G330 has a 4-inch 480 x 800 display and even the HTC Desire C has a slightly better 3.5 inch 320 x 480 screen. The border above the screen houses an LG logo, the earpiece and a proximity sensor, while the one below the screen has the home button, along with soft touch buttons for 'back' and 'menu'. The home button is fairly unique in that the edges contain LED's which light up to alert you to calls, emails and texts. It glows a different colour for each to help you differentiate them and it looks good doing it too. The back of the handset is even plainer, with just a 3.15MP camera lens near the top and another LG logo just below it. There aren't any other features on the back of the LG Optimus L3 2, just the back cover which has a textured, almost brushed metal look to it, but it's very obviously just plastic. You can peel the back straight off by getting your fingernail under one of the grooves on the side. It comes off easily and can be clipped back into place just as easily, though this does raise concerns that it might come off on its own and it's a rather flimsy piece of plastic. Underneath the cover you'll find a micro SD card slot at the top left. This is almost essential as the phone comes with just 4GB of internal memory and it's great that you can get to it without taking the battery out, though you do still need to take the back cover off. The 1540mAh battery takes up most of the visible internal space and under that there's a SIM card slot. The top edge of the phone has a power button at one corner and a 3.5mm headphone port at the other. The bottom of the phone houses a micro USB port used for charging the phone or connecting it to a computer. There's also a tiny hole which houses the microphone. The left edge of the LG Optimus L3 2 just has a volume rocker on it and the right edge has no features at all. All in all the handset looks cheap and plain, but thanks to the dark colours and textured look of the back it comes off as reasonably classy. It's small yet chunky and won't be winning any beauty awards, but for a sub-£100 handset it's about what we'd expect looks wise. The specs are more worrying though, particularly the screen which is distinctly small and low resolution.